ATIB is to raise its capital to LD 100 million through an IPO (Logo: ATIB). 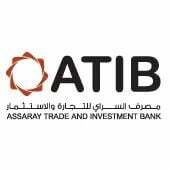 Assaray Trade & Investment Bank (ATIB), a leading privately-owned Libyan bank, announced the opening date for new shareholders to raise the capital of the bank. The news was confirmed to Libya Herald by ATIB’s chairman Naaman Elbouri. ATIB announced on Sunday the opening of the Initial Public Offering (IPO) for new shareholders to raised the capital of the bank to LD 100 million as of 18th February. On 20 January ATIB started the first phase of raising its capital with a closed subscription to existing shareholders. This offer aims to sell 6.666 million shares at LD 20.65/share which will close at the end of this week. The second phase of the IPO will be open to new shareholders starting from the eighteenth of this month at the value of LD 30.975 per share. It will be recalled that the Bank of Commerce and Development (BCD), another of Libya’s leading private banks, raised its capital to LD 250 million last year. The moves by both banks indicates the growth of the private banking sector in Libya in view of the very poor service that the state-owned banks offer.